Cozroh-Codex: The beginning of the charters of the Bishops Ermbert and Joseph, fol. 9. 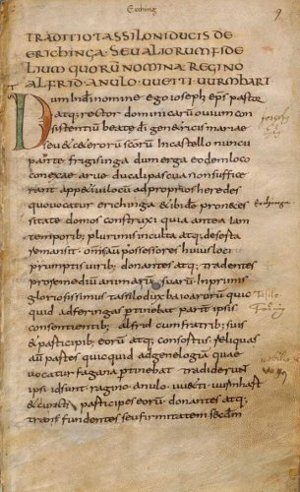 Cozroh's manuscript in the Bayerischen Hauptstaatsarchiv in Munich is a unique document for the cultural history of Bavaria and for the early history of Austria. It includes the oldest Kopialbuch of conveyances to the cathedral church of Freising, thus enabling a glimpse into the donating practices of people inhabiting the old Bavarian settlement areas of the eighth and ninth centuries. It represents the earliest inventory of charters that has been handed down by the Freising cathedral archive, for the originals are lost. In all on nearly 400 pages were written down over 700 documents, including chartae and noticiae, as well as court proceedings. The dates of the originals, ranging from 744 to 848, are largely transmitted in these copies. On the initiative of Bishop Hitto (811-835), the codex was devised by Cozroh, the director of the episcopal chancellery at that time. The reordering of documents and the transcription of copies was stimulated by both contacts with the chancellery of Louis the Pious and disputes over property. At the same time, the episcopal chancellery had to master changes in Carolingian administrative practices. The codex consists of three parts, only two of which were foreseen, namely a cartulary of conveyances during the time of bishops Ermbert (730 (?) - 748), Joseph (748-764), Arbeo (764-783) and Atto (783-811), and a second with the conveyances and the proceedings of litigation under Bishop Hitto (811-835). Both of these parts of the Kopialbuch, comprising 22 and 21 quaternions respectively, were written in the Freising scriptorium contemporaneously and conjoined by the 23rd quaternion of the first part, which contains the register to the donations of Bishop Hitto's time. In the third part, written after 835, the Kopialbuch constitutes a concluding record of the transactions under Hitto's successor, Bishop Erchanbert (836-854), which reaches up to the year 848. Thus, in all, the cartulary represents a working process of about 24 years. The style of writing stands not only within the Carolingian tradition of the time of Louis the Pious at the beginning of the ninth century, but also within the written culture typical of Freising in the eighth century. Illuminating colors, mostly brick red, were used sparely. The beginning pages of discrete sections are found in the first part of the Kopialbuch on folios 9, 25 and 73; in the second part on folio 187. The inventory of documents copied into the Kopialbuch reaches back to the early Agilolfingian and Bonifatian period with important charters of Duke Tassilo III, for instance the founding charter of Innich on folio 73. The text follows neither a chronological nor a topographical order. Indeed, the textual patterns alternate. Thus, the most important charters of Atto's period are no longer donations, but also the decisions of disputes recorded at royal or comital courts, or at synods. The transactions during Hitto's tenure are sorted with respect to their dating by imperial year, which might correspond to the filing of the originals in the Freising archive. on folio 357 a marginal cross marks the transition to the transactions under Bishop Erchanbert and the appending of additional charters from Hitto's time on two quaternions up to folio 369v, where the end of the Kopialbuch was envisaged. On four further, partly incomplete quaternions, the charters down to 848 were copied around that same year. The first and second parts of the manuscript were mostly composed by Cozroh. Later, he relied upon helpers from the scriptorium. In the third part, up to the end of the Codex, there is evidence that Cozroh oversaw the production of the text. In sum, the manuscript presents a broad spectrum of the writing practices of the Freising scriptorium during the first half of the ninth century. Adelheid Krah, Die Handschrift des Cozroh. Einblicke in die kopiale Überlieferung der verlorenen ältesten Archivbestände des Hochstifts Freising. In: Archivalische Zeitschrift 89 (2007) S. 407-431 [pdf]. Dies., Veränderungen der Wirtschaftsentwicklung und der Strukturen im Bistum Freising zur Zeit der Bischöfe Hitto (810/11-834/35) und Erchanbert (835/36-854)". In: Beiträge zur altbayerischen Kirchengeschichte 58 (2018) S. 5-110. Wilhelm Störmer, Sundarheri scriptor, der Lieblingsnotar Bischof Arbeos in den Traditionen Freising. In: Theo Kölzer u. a. (Hrsg. ), De litteris, manuscriptis, inscriptionibus...(Festschrift zum 65. Geburtstag von Walter Koch), Wien u. a. 2007, S. 17-25 [pdf]. Ders., Zur Bedeutung der Gerichtsprozesse in den Freisinger Traditionen (8./9. Jahrhundert). In: Konrad Ackermann-Herman Rumschöttel (Hrsg. ), Bayerische Geschichte. Landesgeschichte in Bayern (Festgabe für Alois Schmid zum 60. Geburtstag), München 2005, S. 255-273. Joachim Wild, Charta und Notitia im Herzogtum Bayern. In: Theo Kölzer u. a. (Hrsg. ), De litteris, manuscriptis, inscriptionibus...(Festschrift zum 65. Geburtstag von Walter Koch), Wien u. a. 2007, S. 27-37 [pdf]. The inventory: Folio 1 - 72 | Folio 73 - 173 | 173v - 266v | 266v - 397 (in german).